EEK. Gothic outfit alert! Sorry to those who prefer me in colour! All Topshop too, which is a pretty poor effort from me as I do make a conscious effort to not wear all Topshop. Even my lipstick is Topshop! I do apologise in advance if Im wearing these tunics in a lot of upcoming outfit posts, I do really love the fit and the cut and I did buy it in practically every colour! I haven't worn my leather look leggings in a while and they are a bit too big for me since I went back to the gym, but they still look pretty cool! Even if I have baggy knees! Im so in love with AA Nails polishes at the moment, Neon Green has to be my all time favourite colour even though it has to be one of the worst polishes I've ever used. I shall review it on ETCLLYMLRS as soon as I've worn it a bit more to get a feel for the polish! I doodled a bit on my pinkie on my left hand with some ebay nail art pens (I reviewed them here), I might do all of them if I feel up to the challenge! I wore my "game of thrones" coat in honour of the last episode of the second series. I can hardly believe Im wearing a fur coat in June! Was our summer those few hot days we had last week? Today I've been doing the mega boring task of sorting out all my receipts to hand over to my accountant. I don't think he'd appreciate me shoving a box of crumpled receipts into hands! I've been craving Japanese food all day so I've just ordered some and I can barely wait for it to get into my tummy! People across the road from me are having some sort of party, I presume its sports related as I've heard whoops and hollers for most of the day. A bunch of grown men screaming like little girls? Very annoying! I've also started watching Workaholics because my friend Greg has been pestering me to watch it for months. Bit of a random one today as I seem to be typing whatever seems to pop into my head! Least its better than yesterdays post, Sorry about that! PS. I've used so! many! exclamation! marks! in! this! post! you look really pretty especially with the darker lipstick, very nice! 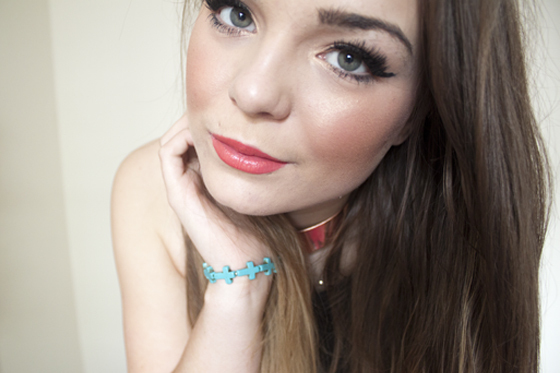 The neon is beautiful against the black and the lipstick is really lush on you! a coat in the summer? in america this would lead to a stroke! lol lovely outfit though! its been raining all day here! yes, as I'm self employed i need someone to work out my taxes and stuff for me as there is no way i'll be able to work it out myself! Wow, the blue + green combo is just PERFECT! Wonderful :)! that nail polish is amazing! as soon as i saw them on the website i had to track them down! You look gorgeous, shame about sorting all the receipts out! Doesn't sound a fun way to spend a bank holiday monday. it was so frustratingly boring but its my own fault for being so slack with it! I love this tunic! I already have it in grey hehehe. Went a size up so I could ~maybe~ wear it without leggings in summer, wind depending! i sized down (well I got a 8 and Im currently more towards a 8 than a 10) its pretty baggy though! i reckon you could probs get away with wearing it as a dress though, I wore it with shorts the other day! You have an accountant this is so intriguing. I'm self employed so I have to, because lets face it i won't be able to work out my taxes and stuff myself! Eek super excited for the game of thrones finale! We have friends coming over for the occasion :) cos we're geeks lol. Love your Game of Thrones coat! I'm just coming to the end of book 3 and I am OBSESSED with it - cannot stop reading! its amazing isn't it! book 4 is really hard to read but i finished it a few weeks ago and I'm finally on book 5! plowing through it at the moment! I keep getting hassled to get a business credit card I'm just my own worst nightmare when it comes to organising things! must do this soon though! Such a cool outfit! Love this, the neon looks so amazing against the black! Can I just say I love everything about this look especially the necklace, top and nails ? Wow ! Love this outfit, you look amazing! What a nice feeling it must be to find a few clothes that don't fit you anymore after going to the gym! Am currently in the process of fighting off a little excess weight that has gathered over the year, in time for summer - but keep falling off the band wagon! You have such a gorgeous figure! I wish I had the willpower to go to the gym! I'd love to know how you maintain such a lovely figure (especially with all the tasty treats you post on instagram!). 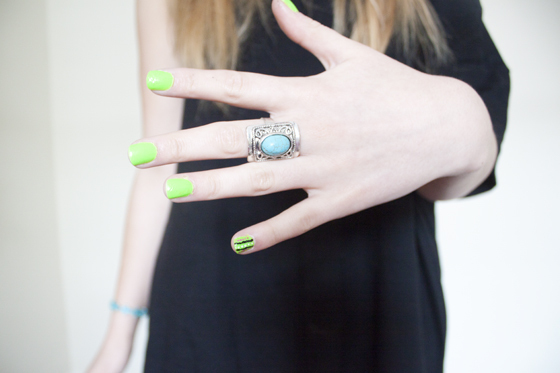 Green nails uhmmm. Have to think about it. But all the rest is so cute and elegant, you look gorgeous in black too! Here's some more exclaimation points - You look fab!!! Love the all black look, it isn't goth, it's chic, just like you! I did a blogpost this weekend on ym Jeffrey Campbell collection, take a look, Lily! haha I'm terrible for using so many exclamation marks in my posts too, bad habit! 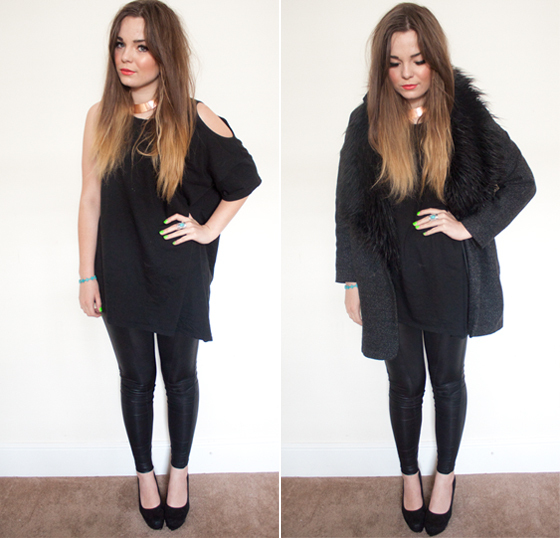 there I go again... and totally don't blame you for the whole topshop outfit, i'm obsessed. So beautiful! Loving the color of your nail lacquer. I absolutely love your all black outfit - it is not goth at all! That nail polish really caught my eye! Your eye makeup & lipstick look extra stunning in this photo! i love thea symmetrical top!! its so cool. amazing lashes too!! I looove the ring!! Is it one of your´s? Or where did you get it? I love your nails! I love the neon with the black! Your lips are also really nice, I'll have to read the review. You always accessorise so well! I love the turquoise in your bracelets and rings. I like you in black too! Oh gosh I feel your pain, I've just spent the day doing a stocktake and sorting out my books, its the end of the financial year here soon, yawn! Nice outfit too, I love the pops of colour! I love that top so much i had to buy it in black and white. I wish they made more colours of it though, i feel i need to work harder with accessories so that the outfits not so bland and has a nice pop of colour.